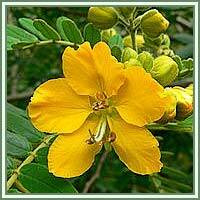 Habitat: Senna is native to India, and is cultivated mainly in southern India and Pakistan. Alexandrian Senna is native to Egypt and Sudan. It prefers warm climatic conditions. Description: Senna is a small shrub growing up to 1 meter in height. It has a smooth and branching, pale green stem, and feathery, oval and lance-shaped leaflets. Leaves have distinct veins on their under surface, grayish-green in color. Flowers are small and yellow. Fruit is horned and broadly oblong pod, containing about six seeds. Pod is greenish-brown to dark-brown in color. Useful components: Flavenol group compounds and anrathquinone group compounds, menitol, sodium, potassium, tartarte, salisilic acid, crisophenic acid, volatile oils, resins and calcium oxalate and crisofenic acid. 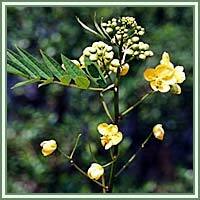 Medicinal use: Senna is considered to be anthchiiintic, antipyretic, cathartic, diuretic, laxative, purgative, and vermifuge. It is usually consumed dry in form of a tea. It is most commonly used for its laxative and purgative effect, but it must be taken in a limited period of time and in right dosage. Senna is suggested in treatment of acute constipation, and after rectal surgeries, since it softens the stool and promotes bowel movement. Combined with aromatic herbs, Senna can be helpful in treatment of flatulence or colic. Used externally, it can be helpful in cases certain skin conditions, such as acne and ringworms. Safety: Do not use Senna for more than 10 days. Also, and overdose of the plant leads to intense abdominal pains. Consult your doctor/herbalist before consumption of Senna.